Absolute Final Deadline Tomorrow in the 2018 St-Boniface Mega Million Choices Lottery! 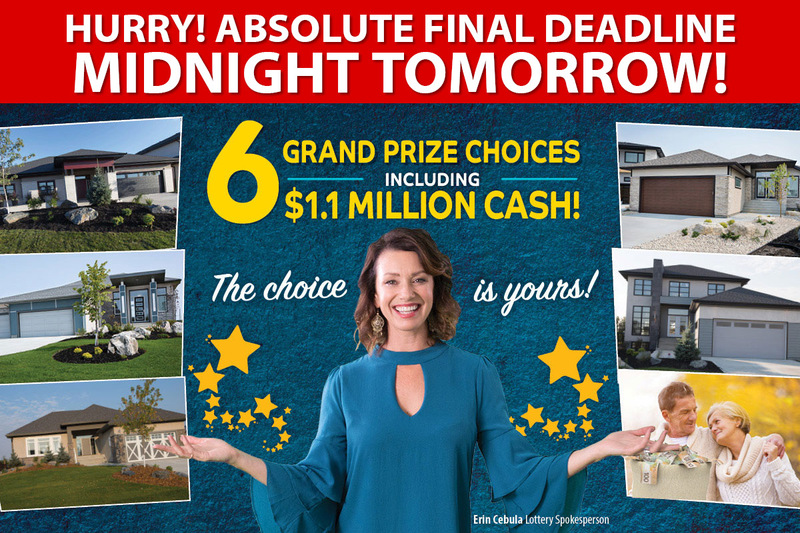 You are here: Home > Absolute Final Deadline Tomorrow in the 2018 St-Boniface Mega Million Choices Lottery! Published on March 20, 2018 at 10:00 pm . WINNIPEG, MB, March 21, 2018 — Midnight tomorrow is the absolute final deadline in the 2018 St-Boniface Mega Million Choices Lottery. You have 1.1 million reasons to buy: 1 of 6 Grand Prize *Choices* — all worth over $1.1 million! Including home packages in Winnipeg, Charleswood, Headingley, and the Okanagan in B.C., plus cars, furnishings, and cash. Grand Prize worth up to $1.44 million. Or choose $1.1 million tax-free cash and become an instant millionaire! Help Save a Life Today! Your friends, your family, your loved ones, or even yourself… we all depend on St. Boniface Hospital. When you purchase tickets, you’re helping save lives right here in Manitoba. Plus there’s more — travel, cars, gift cards, and cash options on every prize! More than 3,300 to win — AND the 50/50 PLUS™ and Big Score Plus™. Cash options on every single prize! Over 3,300 prizes, tons of cash to win. PLUS the 50/50 jackpot — now over $920,000 and the winner takes half! And the Big Score PLUS, with $162,000 to win – new winners every day for 61 days! Absolute Final Deadline Tonight in the 2018 St-Boniface Mega Million Choices Lottery!